since polaroid announced in february it would stop producing film, there has been so much internet activity related to saving/using/sharing, etc polaroid. it got me thinking about how i haven't touched my cameras in forever. i dug out my camera a few weeks ago and it's been sitting on my floor ever since. today, i will finally use it. i found 4 packs of film with the cameras, 2 600 color and 2 600 b&w. i figured i should buy some more since you won't be able to it after next year so i did a quick search on the b&w film since it's my favorite. it's no where to be found. apparently they actually discontinued that years ago (my film on hand expired in 2003) and on that note i guess it's in hot demand since it's impossible to find. so do i keep mine and use it or try and sell it? i'm stocking up on color so i'll have some for at least a few years. 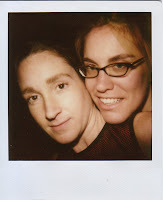 shannon & dawn - polaroid - date ? OMG i wasnt a mum yet and we were off to catch new bomb turks and bottles+skulls at bottom of the hill i was`a ceo and had my vw, you werent married yet...weird. i thought all polaroid had been disco'd when bw was. im sad about it. use it.